Every week the 2013 Subaru BRZ/Toyota GT 86 gets a new award and the sporty coupe along with the new 2014 Forester is getting more global attention. 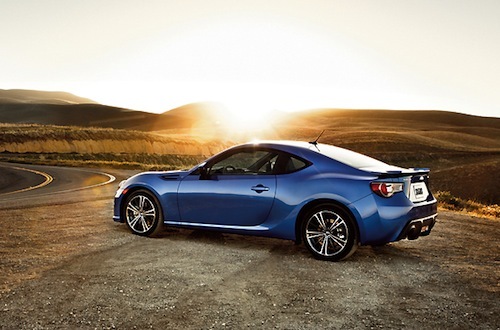 Ever since the 2013 Subaru BRZ hit dealer showrooms, it was an instant hit with buyers. Even before it was officially launched, it received much media attention. The two-door rear-drive coupe that was developed with Toyota also produced the 2013 Scion FR-S/Toyota GT 86. The trio has been receiving awards all over the globe and now gets another trophy to add to the long list. Subaru Australia has just announced it has won the News Limited Carsguide People’s Choice Award. The all-new 2013 Subaru BRZ, in conjunction with the Toyota 86, had previously been named Carsguide’s Car of the Year in December. Now the jointly produced cars by Subaru and Toyota have another award to add to the trophy case. Together with the Toyota GT 86, the Subaru BRZ gained an impressive 21 percent of reader votes in the People’s Choice award. In addition to getting the top award, BRZ and 86 also fared well in the sub-categories. The duo also won the Sports/Luxury section, with 31 percent of the popular vote. Subaru has been gaining worldwide attention in this new global economy with other cars in their lineup. The all-new 2014 Forester won the Best SUV/Recreational section with 27 per cent, and the Australian Liberty achieved third place in the Best Family Car section, gaining 19 percent. The new Forester has been wildly popular around the globe and Subaru may have another winner with the new crossover that has been completely remade. Subaru announced last month that the all-new 2014 Subaru Forester orders in Japan had exceed 8,000 in its first month and more than quadruple their monthly target. Orders for the all-new crossover reached 8,149 units as of December 16 in just one month after its launch on November 13. This breaks the monthly sales target of 2,000 units by more than fourfold. The new fourth-generation Forester has been completely redesigned and features a newly designed exterior, roomier interior, improved performance and improved fuel economy across the line. A new 2.0-liter turbocharged boxer engine leads the list of new features for the crossover and it will also be powered by a 170-horsepower 2.5-liter naturally aspirated Boxer engine. The 2.5 models with the automatic CVT will achieving manufacturer-estimated fuel mileage ratings of 24 mpg city / 32 mpg highway / 27 mpg combined. The latest BRZ /GT 86 award caps a remarkable run of awards in the last 12 months. It has received the TopGear Australia Fun-est Car of the Year 2012 Wheels Car of the Year 2012, News Limited/Carsguide Car of the Year 2012, and Carsales Australia network’s People’s Choice Best Performance Car Under $100,000 (with the Toyota 86). It has also received awards for the Best Buy for 2012-Australian automotive website themotorreport.com.au, Best Sports Car of 2013, from the Canadian Autos.ca website, BRZ engine – winner, 2013 Ward’s 10 “Best Engines”, United States, 2013 Sports Car of the Year by Canadian website Auto123.com, 2012-2013 Japan Car of the Year “Special Award” (with the Toyota 86), and the 2012 Sports Car of the Year in French car magazine,Echappement. As the 2013 Subaru BRZ/Toyota GT 86 keeps racking up awards around the globe, the all-new 2014 Subaru Forester is starting to get global attention. Don’t be surprised to see the new crossover getting similar praise worldwide.